On Oct. 12th 8pm PDT! The World Finals of SWC 2018 is coming! A total of 8 Summoners who survived from each regional tournament will have the final battle in Korea! Please tap the link below to find out more about the info of our 8 finalists. This time, we've prepared a special streaming event for Summoners who will be watching SWC 2018 via live stream! Before that, make sure to subscribe to our eSports channel on YouTube to get notifications for SWC 2018! 1) For all live stream viewers! Rewards guaranteed! We'll be giving out the following rewards for all viewers! * Above rewards will be given via coupon codes. Coupon codes will be revealed in order during live streaming, so stay tuned! 2) Live Stream Viewer Achievement Reward! Special rewards will be given when we reach the following no. of viewers! * We'll put up another notice regarding whether we've reached the designated no. 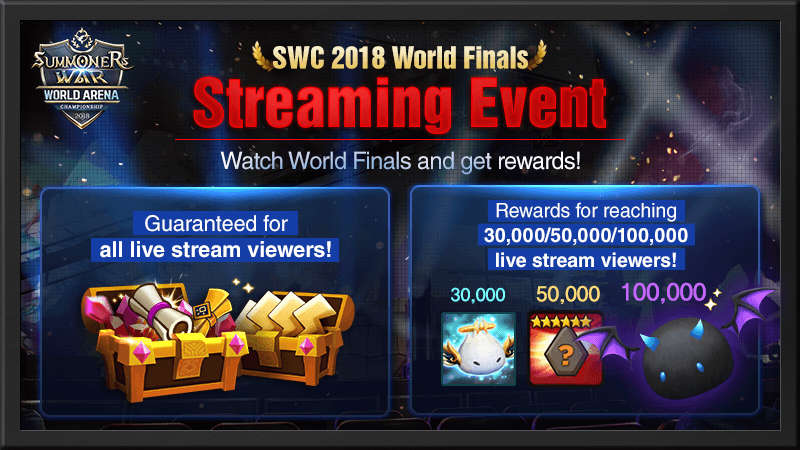 of viewers and details about the reward distribution after the SWC 2018 World Finals ends. We once again appreciate all of your support and interest in SWC 2018. Nice Rewards, but I am slightly confused. Where will this be streaming? Will it be on the official Com2Us Twitch channel, or somewhere else? No idea on twitch channel temsik..but u can check the info in sw event icon..normally i'll make it thru youtube e-sports channel..just ensure the timezone is tally..
What about EU players? Are we expected to watch the stream at 5am? Or will the coupons codes last for like 24h? So SWC is at lunch time gmt+8? nice rewards, i'll have to set up alarm.